Newsletter #32 Where is all the water going that we are conserving? Next,Just heard this on Pandora (actually my son heard it and passed it on). 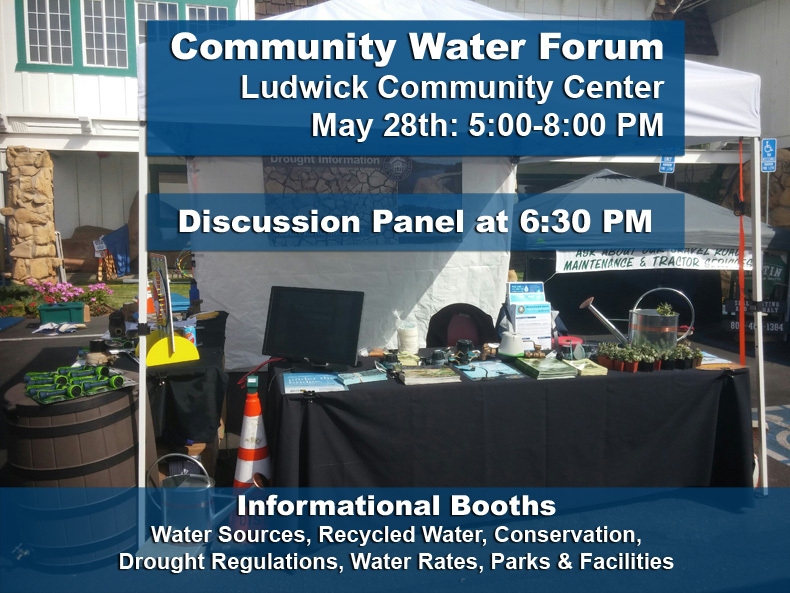 City of San Luis is putting on a Water Forum at the Ludwig Center Thursday May 28 5pm-8pm Discussion Water: Fact or Fiction @ 6:30. There wasn’t a speaker agenda so don’t really know who is talking about what. I will have a couple of questions though. Maybe you do too.Where is all the water going that we are conserving? 20% cutback in home usage could add up to millions of gallons. Will that buy us some time? NASA reported we only have 10 months of stored water left. 20% saved could buy us a couple of months of water. And how exactly are we going to collect on all this saved water? I would hate to think that I am saving this water for a rainy day and it ends up going to someone who didn’t save a drop. I am thinking new construction and worst yet our precious saved water is going to a non essential, secondary, industrial production like oil drilling that is asking for a 3 fold increase in its water usage. And that leads to the bigger question what about the county and all the water in the unincorporated areas? I’ll get to that in a moment. The other question is about the fines for wasting water $500? Who collects those fines and where does the money go? General Fund? Water fund? Utility company? Maybe these questions will be answered. I hope so. Here’s the link for more info. And remember Denton,Texas where Fracking first began and they just passed an ordinance to ban it? “As for the grass-roots fight in Denton against fracking, Frack Free Denton President Adam Briggle said that will continue. Believe it or not this ruling is very helpful in the construct of our next move here in SLO county. But I am truly sorry to hear about Denton. We might send them some words of encouragement and support. We are all in this together so here’s a Frack Free Denton link to let them know we care and are pulling for them. Think our next move is a countywide moratorium on non essential water use for oil extraction. Non essential water use is defined as: water uses that are not essential nor required for the protection of public, health, safety, and welfare. Under this definition, irrigation of landscape areas, including parks, athletic fields, and golf courses, washing cars, washing down sidewalks, filling swimming pools, fountains are non essential use and restricted or moratoriums issued. Some of these protocols have already been implemented in cities and counties across the State. But there is one very blaring, critical omission on this list of non essential water use. Water used to extract oil. Since there is no mention of water used to extract oil and in particular oil extraction that is exempt from the Clean Water and Safe Drinking Water Acts, we need to add that to the list of non essential water use and implement a moratorium on it. Currently Freeport at the Arroyo Grande Oil Fields is extracting 384,600,000 gallons of fresh water that is used to extract a hazardous and toxic product, oil and the water used is then reclassified as a hazardous waste because it came in contact with benzene, radioactive isotopes, hydrogen sulfide, etc and poses a real threat to the safety, health and well being of all water. The threat is, this hazardous waste is re injected back into the ground where it can infect the essential ground water. And once the water is infected life gets very very difficult and not fun real fast. The Board of Supervisors is the lead agency and has the final say on this issue of essential and non essential water use in the unincorporated areas of this county. The final say – a moratorium issued on non essential water use to extract oil within San Luis Obispo County.There is just so much water to go around, this is an emergency situation and it needs an emergency response. A moratorium that plugs up a loophole and secures our water for essential use is an appropriate first response to an emergency. And, it is not a ban on fracking or oil drilling. It is a moratorium on non essential water use. And, it is following the Gov.’s order to cutback and conserve water and to treat every drop like it was our last. I will have the petition to sign at the premier showing of Split Estate this Tuesday May 26, 7-9 pm at the Steynberg Gallery and also at the Community Water Forum on Thursday 5-8pm at the Ludwig center. And last but not least Federal ruling calls future of Diablo Canyon reactors into questionFriends of the Earth: Decision is beginning of the end for troubled nuclear plant. Hearing faints sounds from the fat lady in the wings tuning up. Making memories on this Memorial Day 2015. This entry was posted in All, Call to Action, Events, Newsletter, San Luis Obispo County, Updates and tagged Board of Supervisors, Board of Supervisors contact info, Emergency Moratorium, newsletter all hands on deck. Bookmark the permalink.